If an exception is thrown while your code is executing and you don’t have a handler that catches the exception, it is considered an unhandled exception. An unhandled exception is one that travels all the way back up the call stack without encountering a handler that catches the exception. When an unhandled exception occurs, the application will stop executing and display an error message. 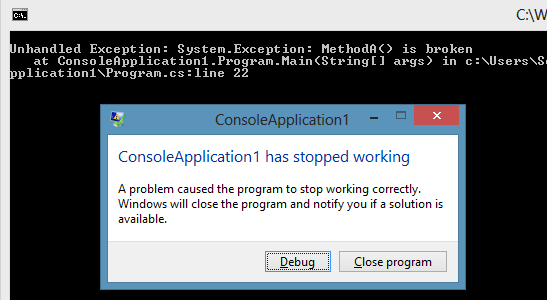 For example, if we call a method named MethodA from a console application and it throws an exception that we don’t catch, we see some information about the exception dumped to the console and an error window. 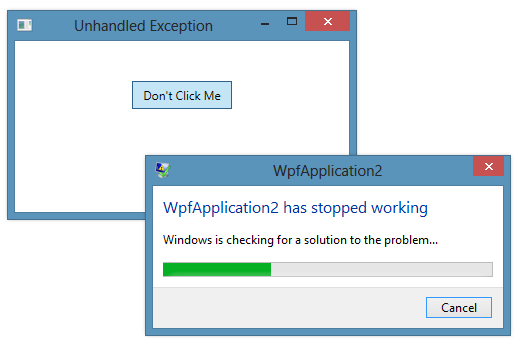 If you are using Windows, a good library for handling unhandled exceptions and crashes is CrashRpt . If you want to do it manually you can also use the following I wrote in this answer .